World Class Golf At your Door Step. What could be better than looking out over the Caribbean Ocean? Overlooking a golf course and the ocean at the same time while luxury yachts come and go from the marina! 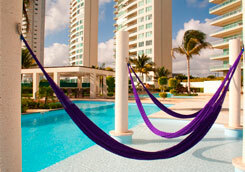 That is what Cancun Towers has to offer. With so much to do in Cancun, deciding what to do just got a little more difficult as the Towers are located immediately on the course. A quick cart ride gets you to the Clubhouse, the practice facility or the # One Tee box. Designed by Tom Weiskopf, award winning designer and British Open champion, this 18-hole course is laid out over 185 acres through out Puerto Cancun. Weiskopf, who won 15 tour titles and five foreign championships, has a vision for each project. A challenging design, the course includes narrow fairways, water features, creative green placement including an island green, treacherous bunkers and an entire hole along the beach. Now that's a sand bunker! Overlooking the ocean, the strategic course layout will test both long and short games, for players of all levels. Golfers will also enjoy the Clubhouse, offering everything from a full service restaurant to a fully stocked pro shop. If you are an avid golfer, then you probably teed off at one of Tom's courses and know the spectacular beauty and thought that goes into each course he designs and Puerto Cancun Golf Course will be no exception. 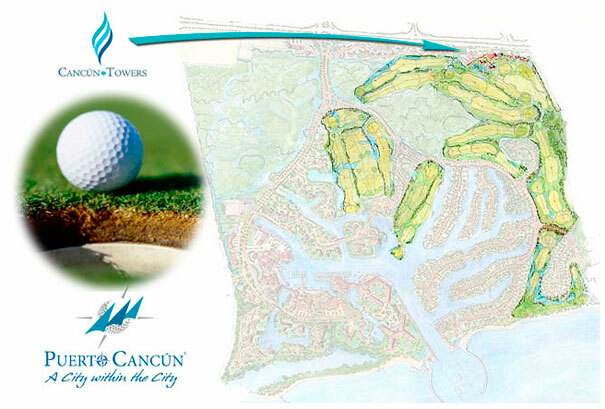 You can access the golf course directly from Cancun Towers with your own golf cart or personal car by following the roadway with in the community. 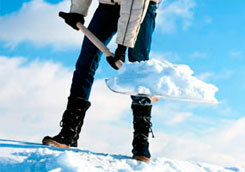 The Ridge at Castle Pines North, Castle Rock, CO, is No. 66 on Golf Magazine's Top 100 You Can Play List. The Shanty River Cedar River Course, Bellaire, MI, is No. 84 on Golf Magazine's Top 100 You Can Play List. The Quail Hollow Course in Painesville, OH, is No. 100 on Golf Magazine Top 100 You Can Play List. Shadow Glen Golf Club in Olathe, KS, was voted Best New Private Course of 1989 by Golf Digest. Double Eagle Club in Galena, OH, is No. 60 on Golf Digest's America's Top 100 list. Forest Highlands in Flagstaff, Arizona is No. 57 on the same list. This course boasts some unequaled qualities, such as the most beautiful view of the Caribbean Sea, landscapes along the Nichupte lagoon and age-old archeological treasures from the Mayan culture. The Hilton Cancun Golf Course Recently purchased by Iberostar, is both enjoyable and challenging for golfers of any skill level, is ideally located on the hotel property and easily accessed on foot or via hotel provided transportation. One hundred fifty acres of tropical paradise surround the 6,734 yard, par 72 course. The waters of the Nichupte Lagoon and its inlets border many of the holes, as do the Mayan Ruins of El Rey (circa 500 A.D.) along Hole 16. As you play, enjoy a vista of tropical vegetation and plentiful wildlife as varied as crocodiles sunning themselves, iguanas analyzing your game and colorful birds decorating the sky. All this adds up for a round to remember at the Iberostar Cancun Golf Club. El Camaleon is the only course in the Riviera Maya featuring two holes just steps from the Caribbean Sea. While each hole shines with its own particular magic, it's the par-3s that already are earning the loudest raves. Hole No. 15 will define the El Camaleon experience. At only 160 yards from the back marker the hole plays directly towards the vibrant waters of the Caribbean Sea. The large green sets the stage for a memorable shot as the nearby waves gently soothe the golfer's soul. Don't be fooled, this hole is not to be taken lightly, especially when the tropical winds pick up. Regardless of your score, the ocean view will remain with the player long after the round. No. 7 also plays right to the edge of the Caribbean Sea with the sand and the spray punctuating the breeze. In the distance is one of the world's largest coral reefs and the island of Cozumel. No. 10 is another short hole that is long on memories. The figure eight green is lined with drama. A shot too long or to the right drops deep into the crystal waters of the canal. The Moon Spa & Golf Club is home to the only Jack Nicklaus Signature golf course in Cancun and is set on the rolling Cancun - Riviera Maya landscape. Its dynamic layout requires golfers to navigate through native vegetation as well as numerous wetlands and strategically placed bunkers. Each of the three-nine hole courses offers a distinctive environment that challenges professionals and amateurs as well. Iberostar Hotels & Resorts proudly celebrates the one-year anniversary of their spectacular 18-hole, par 72-golf course at the Playa Paraiso Golf Club with praises from one of the world's most respected interpreters of the luxury lifestyle. Playa Paraiso's graceful undulating greens, lush tees and narrowly sculpted fairways are lined in extensive stonework paying homage to the Mayan jungle. The golfer's heartbeat and breathing find an easy rhythm. Eyes focus, the lower back muscles relax and the shoulders soften. Enjoy all that while it lasts as the 11th and 12th holes are waiting, lurking and poised to humble, especially if you are playing from the longer of the four sets of tees.